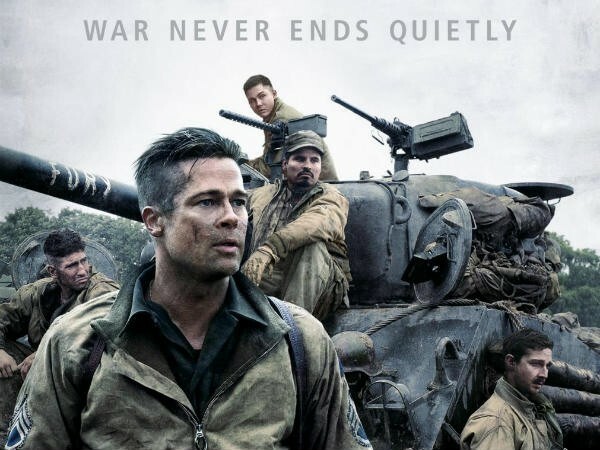 Brad Pitt starrer "Fury" is a war film set during the World War 2. Read the movie review of Brad Pitt starring film. Brad Pitt starrer "Fury" is a war film set during the World War 2. The Hollywood movie, which was released two weeks ago in North America, is ready to hit screens tomorrow in India (31 October). "Fury" has been appreciated for its brilliant direction by David Ayer, and for electrifying performances by Brad Pitt, Shia LaBeouf and Logan Lerman. The captivating war sequences have also caught viewers' attention. The film is brutally violent, loud and tailor-made for action lovers, as per the audience who have seen the movie. I wouldn't be surprised if @LoganLerman gets an Oscar nod for his performance in #Fury - Definitely held his own. I'm not a huge fan of war #films but I just saw #Fury. Absolutely riveting. #fury is recommended. Brad Pitt and Logan Lerman particularly strong performances. David Ayer's #FURY was brutal. Incredible acton sequences and an amazing performance from @LoganLerman. Whew. Love a good war film and Brad hasn't disappointed in #Fury ! Very much enjoyed my afternoon watch! #FURY was fantastic...easily one of the best war movies I've seen in fact. Can't wait to see what @DavidAyerMovies does with SUICIDE SQUAD! I don't usually like war movies, but i saw #fury last night & LOVED it. surprisingly accurate depiction of history. #Fury has some of the most intense scenes since #Gravity. Coincidence or not but Steven Price did the score for both these movies. A movie still from "Fury".Production House - Columbia Pictures.